The seemingly-unnatural gap in the boardwalk between Seaside Heights and Seaside Park will likely continue for some time, officials said. Two years after a boardwalk fire raced northward from the area of Funtown Pier into Seaside Heights, no applications have been submitted to the Seaside Heights planning board to rebuild the section of boardwalk between Dupont and Porter avenues, the southernmost street before the Seaside Park border. 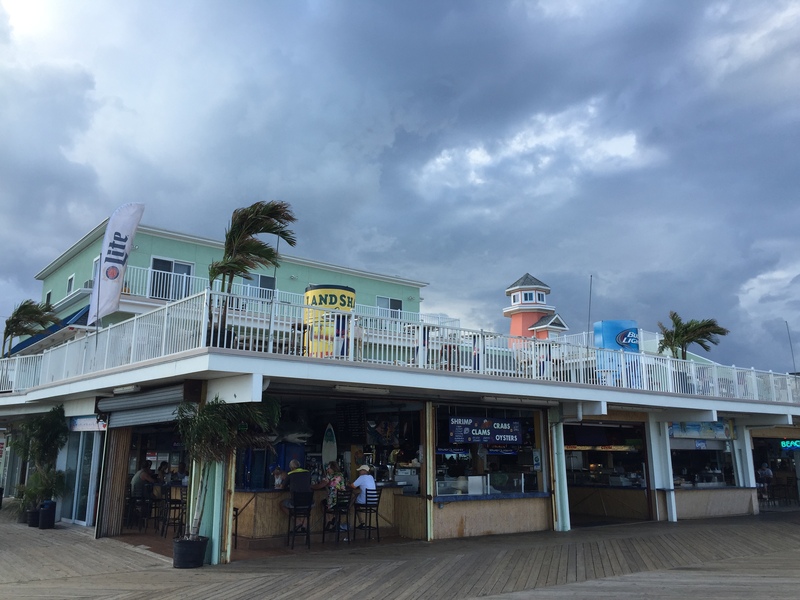 “I don’t think we’re going to see any applications in the near future,” said Seaside Heights Administrator Christopher Vaz. Though he’s not privy to details, Vaz said the land is under contract to be sold, though contingencies will likely delay any development on the site well into 2016. 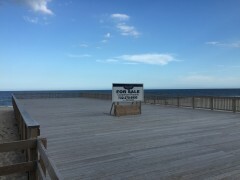 The remainder of the boardwalk gap is in Seaside Park, where Funtown Pier’s owners have recently indicated they are waiting on the outcome of a planned U.S. Army Corps of Engineers beach replenishment project before deciding whether to rebuild the pier. Previously, owner William Major has indicated that in order for a rebuilt pier to be profitable, a variance to allow tall thrill-style rides will be required. This summer, Funtown Pier leased out its privately-owned beach to a company offering ATV rides in the sand, drawing mixed reviews from locals concerned over the condition of the beach. On the boardwalk portion closest to Seaside Heights, a temporary theme park featuring several jump-style attractions was set up. Carbone, who was appointed to the borough council this summer, has said his business was saved by sprinkler systems that were added during his recovery from Superstorm Sandy, which also included the opening of a popular rooftop deck overlooking the ocean. “I was inside there during the fire,” said Carbone. 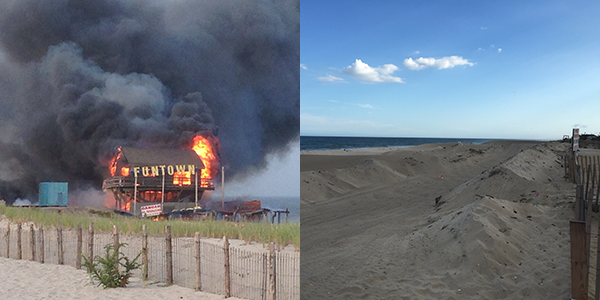 The Beachcomber was surrounded by flames during the fire, and represented the first business in Seaside Heights to survive the blaze, which was driven by strong southerly winds. Firefighters ultimately drug a trench on the boardwalk to prevent it from spreading further. Though not a victim of the fire, the former Beach Bar site is also still vacant. Though a pier has been built in the plot of sand that formerly was home to the watering hole, nothing has been built on it. The pier is for sale through a local real estate firm for $3.3 million, and includes a riparian grant that would conceivably allow a new owner to extend the newly-built pier 1,000 feet into the ocean. The pier’s zoning would allow it to be operated with another bar and restaurant built there, or as a hub for games and rides.